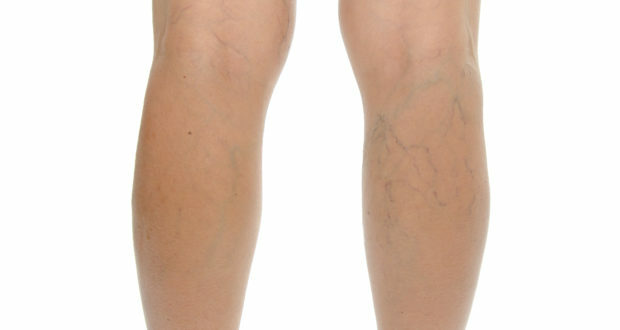 Varicose veins are twisted, enlarged veins near the surface of the skin. They are most common in the legs and ankles because standing and walking increases the pressure in the veins of your lower body. They usually aren’t serious, but they can sometimes lead to other problems. Varicose veins increases with age because of wear and tear of the valves in the veins that help regulate flow of blood. Women are more likely to develop varicose veins because of pregnancy, premenstruation or menopause. Family history. If other family members had varicose veins, you may have it too. Standing or sitting for long periods of time. Blood does not flow well. Because of increased blood volume and added pressure to veins. Small “spider veins”. Short, fine lines. “starbust” clusters, or a web-like maze. This type cannot be felt. Veins that are dark purple or blue. Ultrasound is done to see if the veins are functioning normally. This is only done when the doctor thinks this will be beneficial especially in severe varicose veins. Medications are not used to treat varicose veins. Thanks to less invasive procedures, varicose veins can generally be treated on an outpatient basis. Sclerotherapy. In this procedure, your doctor injects small- and medium-sized varicose veins with a solution that scars and closes those veins. Laser surgeries. Doctors are using new technology in laser treatments to close off smaller varicose veins and spider veins. Catheter-assisted procedures. This procedure is usually done for larger varicose veins. Vein stripping. This procedure involves removing a long vein through small incisions. Ambulatory phlebectomy. Your doctor removes smaller varicose veins through a series of tiny skin punctures. Endoscopic vein surgery. You might need this operation only in an advanced case involving leg ulcers.